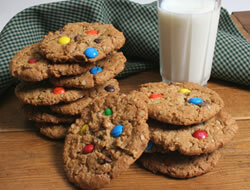 Peanut butter, oatmeal, M&Ms and chocolate chips make a delicious cookie no one can resist. In a large bowl, cream the first 7 ingredients. Set aside. In another bowl, blend the last 3 ingredients; then add to the creamed mixture and stir. 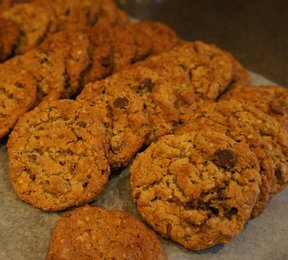 Drop by spoonfuls on a cookie sheet. 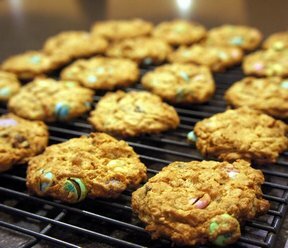 Bake at 350° F for 10-12 minutes or until lightly browned but soft to the touch. Let stand on the cookie sheet for 1-2 minutes before removing to wire racks to cool completely. 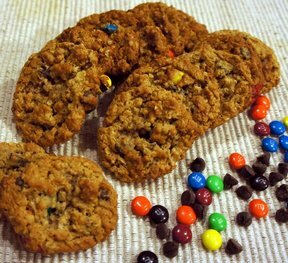 "Made these last night and they were so easy and delicious. I used honey roasted peanut butter."